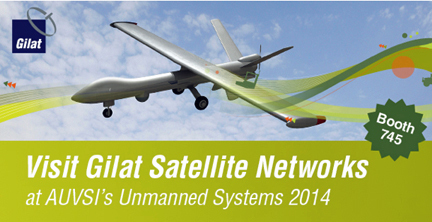 [SatNews] At AUVSI's Unmanned Systems 2014, Gilat will highlight its flight-proven BlackRay 71 UAV terminal product family. Gilat Satellite Networks is synonymous with superior quality end-to-end broadband satellite communications. With over 25 years of experience, Gilat delivers battle-proven, best of breed antennas, VSATs, integrated terminals, network solutions and amplifiers for broadband connectivity in the most challenging environments.